Aston Villa manager Remi Garde has questioned Charles N'Zogbia's commitment and indicated he may offload high-earning players in January. Garde, whose side are bottom of the Premier League, has not picked the midfielder in his last three squads. 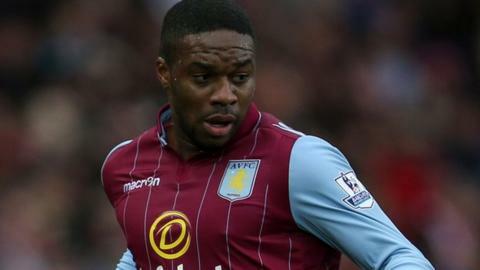 Frenchman N'Zogbia, 29, joined Villa from Wigan for about £9.5m and is out of contract in June. "Charles could have given more to the team in the first two or three weeks after I came," said Garde. He has made only two appearances for Villa this season, coming off the bench in Garde's first game - a 0-0 draw with Manchester City - before featuring as a late substitute in the 4-0 defeat by Everton. Villa face N'Zogbia's former club Newcastle at 17:30 GMT on Saturday. "Charles is not the worst person I have ever met. I am just here to try to pick up the players I feel are the most committed for this very difficult task we have," added former Arsenal midfielder Garde. "I am not saying Charles is a bad person. Sometimes it doesn't work between players and clubs, players and managers." Garde also suggested he may try to move on some of the club's higher earners who are not in his plans. "It's a situation I need to change and clear," said the former Lyon coach. "If you spend a lot of money on players who aren't playing it will be very bad news for the team and everyone at the football club. I'm blaming nobody." Villa captain Gabriel Agbonlahor, 29, has struggled for first-team football under Garde and the striker's future at the club, where he came through the ranks, is also in doubt. "More than [just in] Gabby's case, every player has the possibility twice in the year to come to the manager and say, 'I don't feel you trust me, I don't feel well any more'," said Garde. "For Gabby and the rest of the team, when you change manager and the way of working, maybe suddenly you don't feel comfortable. "I'm not saying that about Gabby especially. It will be the same for every player. "I want to trust my players and for my players to trust me. For Gabby or another player, maybe they will not see what we're doing or where we're going, I don't know."